Is SEO bounded by the PPC paradox ? One of many holy grails in search is striking the right balance between PPC spend and getting appropriate traffic through SEO. By SEO, in this article, I’m referring to the rather narrow definition of position in organic SERPs. A client is ranking on page one, and receiving a paltry amount of traffic for a head term because their URL is ranking beneath competitors. The top positions are way out of reach, because the client is small, new to market, or has an unknown brand. Whatever the reason, the problem for the client is that the competitors are simply gaining the click throughs because they are in top spots. In order to compete, the client turns to PPC and pays to be seen at the top of the page for important keywords, with optimised ad copy and a well organised PPC campaign structure. A client is ranking well on page one, but wants more, much more. In fact, they are bent on annihilating all competitors and are prepared to spend on PPC to achieve this aim. This happens in competitive startups where brands vie for mindshare, or when impressions are all important to boost brand awareness metrics. This scenario is generally a declaration of war amongst marketeers, with PPC adverts littered with brand terms and brand references. Professionals in search are target driven. Whether the target is to increase ROI, leads or conversions or support marketing efforts in a timely fashion. The overriding objective is often to control budgets and minimise waste whilst optimising PPC campaigns automatically through APIs, through tools such as Kenshoo or Marin or manually via Adwords Editor. The process is likely to involve a pivot table or two. CTR for PPC campaigns is undeniably a very important metric. The best PPC managers will also pay attention to natural rankings for keywords used in PPC campaigns. The noble objective is to marry organic ranking data with that of PPC bids/positions and achieve the targets set. Let’s step out of the PPC world for a moment and consider organic search. Most people in search would agree that there are at least 200 different factors involved in determining where a URL ranks in search results. Hold the front page! Furthermore, as time passes it is a safe bet that the algorithms competing and collaborating to determine the mix of results in the final ‘sort order’ become ever more sophisticated. Nothing too contentious there either I hope! Amongst the myriad of ranking factors, it is quite likely that CTR is included in the decision taken. For SEO, Google makes CTR available through GA and GWMT and it can provide useful information when addressing poor calls to action in search results. SEO’s have noticed for some time that new URLs are often ‘tested’ in search results – perhaps to determine an initial CTR score ? The underlying principle here, is that a URL attracting all the clicks, could easily be the most useful page in the search results, especially if visitors hang around on the site post-click. So, it makes logical sense that a URL attracting all the clicks should be promoted in the search results. After all, it is likely to be the best result available. Conversely, a URL with abysmal CTR is unlikely to be kept in 1st place for very long… this seems like a good way to filter out bad sites – URLs in high ranking positions with poor calls to action, poor Ux, or badly laid out snippets will attract fewer clicks and over time drop in search results. My question is: Do you think CTR may be a contributory factor in the calculations to determine the future position of a URL in the SERP? My answer: is that there may be a time-weighted relationship between CTR and rank ie. a time lagged causal relationship rather than just a correlation. Part of the work of an SEO is to optimise snippets to attract clicks (the analogous activity to improving PPC ad copy), one can monitor improvements in GWMT (With Change) statistics showing how the new improved snippet has changed the CTR for the better. Over a period of weeks or months, the URLs with improved CTR often move into higher positions in SERPs. Improving CTRs can help towards an improved rank. The diagram below shows a typical screen layout following a search on Google. 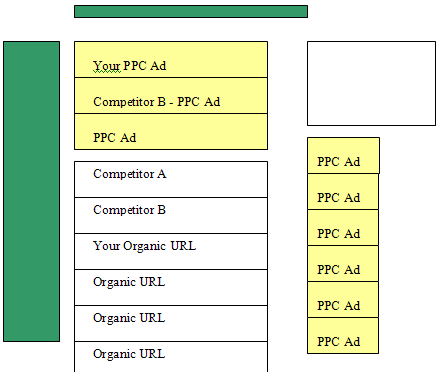 The blocks represent positions of PPC and organic search results that could be representative of any of our PPC scenarios. In this sample layout, your clients PPC ad is dominating the page in position 1, forcing the PPC advert from Competitor B into position 2. The aim of aggressive PPC bidding may be to counteract the competitors strong organic position #2, in an attempt to attract their clicks. The paradox here, is that if CTR in organic results is used to determine rank over time, then by bidding through PPC you are harming your organic CTR. The clicks for your brand will go to your PPC advert at the top of the page, starving your organic result of clicks. A visitor looking for your company or brand, will see the PPC advert first and the organic result in third place will attract less clicks than it deserves. At least some clicks will be lost to the PPC advert at least some of the time. If a visitor sees the PPC advert for your site at the top of the page but chooses not to click on it, then they may be less inclined to click on your organic result too. The decision ‘not to click’ on the PPC ad could be taken when the ad copy is poor or irrelevant, or when they’ve seen the advert before and it didn’t give them the landing page they wanted. Whatever the reason, the PPC advert that you place in #1 must be good else you risk ensuring that the click goes to your competitor. So, running PPC is not a simple decision. A bad advert can turn people away from your brand, and a good advert will also steal clicks away from your organic result, increasing costs. If, as is logical, CTR is used in the calculation of position of your URL in the organic SERPs, then by reducing your CTR as a consequence of running PPC campaigns (optimised or otherwise! ), you are more likely to drop in search results than to improve. Therein lies the paradox of SEO and PPC. Time to test this theory and show some interesting results ! First, pick a single, highly competitive head term, for which the site ranks sustainably in the top 4 and for which there is a history of considerable PPC spend. A term attracting many thousands of the clicks per day through PPC was chosen (typically over 3k visits per day), making it an ideal test candidate for a CTR impact study. Test Stage 1: Does Turning PPC off improve CTR and rank ? For 2 days at the end of March, we turned PPC for this high traffic term off in all our major campaigns. The impact on PPC traffic, for this term alone, can be seen below. When PPC was running, our head term averaged 3rd place organically, with a relatively poor CTR (for third place) of just 5%. The following day (31st March), PPC campaigns were still switched off. The CTR for this term increased to over 15% and average position had improved to 2.5. The really interesting day came next because the average position improved to 1.3. The organic CTR is just 12% because PPC had been turned back on. If PPC had remained off, then the organic CTR in first place would have been higher. By the 2nd of April, PPC was once again running at near previous levels (2.5k a day visitors) for the head term. Once again, the average position for the head term dropped back to 3.0 and the reported organic CTR had dropped back to 5%. The theory was that a CTR of 9% had been sufficient to improve the average position from third to first at the end of March within a day… (stage 1). In order to test this idea, we estimated that by reducing PPC spend by half and waiting for CTR results to come through (as shown above), we might be able to improve organic rank once again. This test started on 4th April and it took until Monday 9th April before we saw improvement in average position. By Tuesday 10th April (one week later), the chosen head term had an average position of 1.2. One week later, aiming to support an organic CTR of 9% in third place, average position improved. By the next day, the head term was in first place. Now that the head term is in first place organically and has a reported CTR of 25%, the next step is to increase PPC once more, to see if there is a point at which we lose this organic position and uncover correlations to reported organic CTR. You can see in the graphs above, that on 13th April, PPC traffic has been increasing and the organic CTR has already dropped back to 12%.